Louisville Tourism honored the hospitality industry’s brightest stars at this year’s annual meeting and awards ceremony on Friday, November 9. Celebrating its 27th year, the event recognizes hardworking front-line representatives of the hospitality industry who make Louisville a successful destination city. More than 600 distinguished guests and tourism professionals attended the event held at the recently opened Kentucky International Convention Center (KICC). The luncheon was emceed for the 10th time by long-time local media personality Joe Arnold. The highlight of the ceremony was the presentation of the ROSE (Recognition of Service Excellence) Award winners. These awards are given to exemplary front-line employees in the hospitality industry in the areas of attractions, accommodations, behind the scenes, dining, transportation and volunteers as well as two new categories – Event Services and Rising Star. There were 49 finalists this year. Event Services: Parker Estes, Eventualities, Inc. Ambassador for the Omni Louisville Hotel. He received a $1,000 cash prize. Each honoree was greeted on stage by Louisville Mayor Greg Fischer and Louisville Tourism President & CEO Karen Williams. Winners received a $200 VISA card, Evan Williams custom labeled bourbon bottle and items from 5-O-Lou, Louisville Tourism, Moss Hill, Louisville Tea Company as well as a beautiful custom glass award by local artist, Casey Hyland. The winners will also enjoy a complimentary overnight stay at one of these hotels: Brown Hotel, Crowne Plaza, Louisville Marriott Downtown, Omni Louisville Hotel and Seelbach Hilton Louisville. The Dan Mangeot Lifetime Achievement Award was presented to Doris Sims, with Danny Wimmer Presents and a retiree of Louisville Tourism after 30.5 years of service. This award is given to an individual who has made significant contributions to the advancement of tourism and has a history of supporting the hospitality industry throughout his/her professional lifetime. The Unity Award recognizes outstanding achievement in the promotion of kindness and unity in the hospitality industry. This year, five individuals who significantly contributed to the successful renovation and expansion of KICC were recipients of the award. These individuals are: Don Parkinson, Secretary of Kentucky’s Tourism Arts and Heritage Cabinet; William M. Landrum III, Secretary of Kentucky’s Finance and Administration; Ellen Hesen, Louisville Deputy Mayor/Chief of Staff; Stacey Church, General Manager of KICC and David S. Beck, President & CEO of Kentucky Venues. The Partner of the Year Award is presented to the person or organization who worked the hardest to advance Louisville Tourism in their efforts. This year’s recipient is the Transit Authority of River City (TARC) for their contribution of the LouLift, an all-electric zero emissions bus, which is free to ride around downtown and to popular destinations. 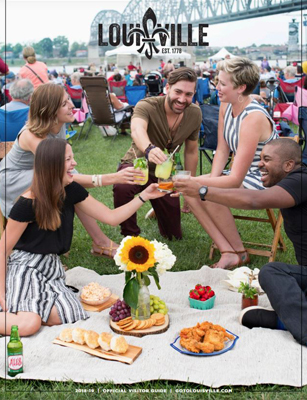 The travel and tourism industry supports over 27,000 jobs in the Louisville area creating an estimated economic impact of $3.5 billion with over 24 million visits annually. Sponsors of the event include Prestige AV & Creative Services, Derby City Gaming, Olio Event Group, KICC, Huber’s Orchard, Winery & Vineyards, Hatfield Media, TOPS Louisville, Greater Louisville Hotel & Lodging Association and Evan Williams Bourbon Experience.